While natural gas and coal continued to lead U.S. electricity generation, both declined in 2017. This marks the first time since 2008 that generation from both of these fossil fuels dropped in the same year. At the same time, renewables – especially hydropower, wind, and solar – continued to rise according to new data from the U.S. Energy Information Administration (EIA). 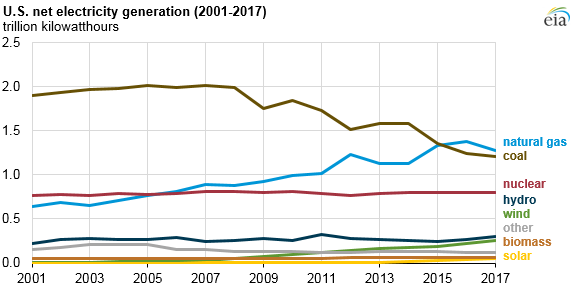 Natural gas has been the leading fuel that is used for electricity generation in the United States since 2015 when it surpassed coal in the generation mix. According to data from the EIA, coal power has been on the decline in the US for the last decade, while low-cost natural gas has risen to become the largest source of electricity generating capacity nationwide. But, in 2017, natural gas joined coal in an overall declining trend as electricity generation from natural gas and coal both fell (by 7.7% and 2.5%, respectively) from the previous year. At the same time, renewables continued to boom. In 2017, wind supplied 6.3% of U.S. electricity generation and utility-scale solar made up 1.3%. These are record shares for both wind and solar. Hydro also supplied 7.5% of total net electricity generation, maintaining its lead as the top renewable source in U.S. power generation.